Our first Biggest Loser Team Challenge is finally in the books. From the smiles and laughter, I think it's safe for me to say it was a lot of fun. True Athlete Performance planned and executed the whole event for us. They have experience running high school sports combines, so putting 11 teams through three challenges in two hours was a walk in the park for them. We declared first, second and third place with bragging rights being the prize. It would be fun to have material prizes for the challenges and the team with the greatest percentage of weight loss each week. Let me know if you have any suggestions for inexpensive, but meaningful prizes. Here are the descriptions of the challenges from Matt Diener, my primary contact at True Athlete Performance. He brought two people with him -- Josh and Alex, so they had one individual running each station. Matt also runs our boxing and functional training classes. For the ladder relay challenge, team members completed a footwork drill through a 15 foot speed ladder, sprinted 5 yards around a cone, and then ran back to tag the next participant. Total team times were recorded and then averaged in order to determine the overall winner. In each of these drills, the goal was to keep your feet moving quickly while staying under control to make sure the drill was done correctly. For this challenge, participants from each team stepped onto a JumpPad and jumped as high as they could from a basic standing stance. 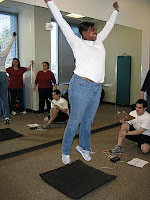 The JumpPad measured the time each participant was off the ground, computing a vertical jump distance in inches. The total distance for each team was added and averaged in order to determine a winner. Proper use of the upper body, core strength, and lower body strength/power are key essentials for this drill, which is why it measures total body power. This was probably the most difficult challenge of the three. The challenge began with one person balancing on a half foam roller. The next person in line then handed them another foam roller. 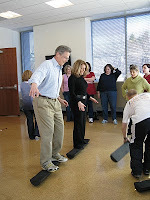 Once the first person put it down in front of them, they moved on to the next roller, while the second person began to balance on the first roller. Each time a new roller was passed forward, the first person could move forward and a new person started. The goal of the challenge was to see which team could get the highest number of players standing on foam rollers at the same time. 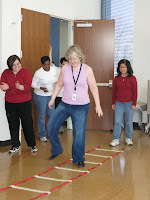 Each team was awarded 2 falls/slips, after which they had to start over and try again. Although difficult, this challenge was a great test of teamwork and strategy in addition to balance and core strength. Hope or Fear – What motivates people to change?